We’d love your help. Let us know what’s wrong with this preview of Planes, Trains, and Auto-Rickshaws by Laura Pedersen. A travel essay of a recent visit to India, which reveals, with humor and insight, the tensions and contradictions facing the emerging world power. In particular, the book explores the roles of women and children in India today and includes discussions with experts on this topic, providing insight into this important and often neglected issue. To ask other readers questions about Planes, Trains, and Auto-Rickshaws, please sign up. I found Pederson's tone a bit flippant and condescending. In a word, miserable. This is a book that has no aim or purpose and lacks any sense of identity. Laura can't seem to figure out if it is a travelogue, guide, history lesson, Buffalo NY promotion, feminist rant, or any number of other turns this disaster takes. There are a lot of great books on India and there are a lot of great travelogues, this is neither. Overall, an informative and interesting read. This book covers a very wide range of topics in overview and I learned a lot about India I didn't previously know. That said, the writing is a bit all over the place with some chapters organized by geographic region or city and others by topic. I sort of wanted to tear the whole thing apart and reorganize it. The author also draws a lot of comparisons between India and New York (specifically Buffalo and Manhattan), which I found to be annoying. I was expecting more from this book. I want to read about the narrator's experience through interaction or integrating with the locals. I appreciate that she mentions some of her culture observations here and there but it was limited. She did added some good insights about India. Most of the chapters feels like reading a school textbook with witty remarks that feels condescending towards the west, particularly New York, because that's where she's from. I agree with all of the below negative reviews. Terribly written, condescending, negative, smug. Her jokes are not funny, and the "history" is basically Wikipedia. A little too flippant for my tastes. The author seemed more interested in making sarcastic comments that were supposed to be funny rather than describing her journey through India. Very thorough and thoughtfully written. I enjoyed it very much. I visited India 25 years ago, and this book took me right back again. Good job! Laura Pederson has moved in a new direction with this nonfiction account of her interest in and exploration of modern India. Beginning with an explanation of her fascination with India, she humorously relates how the TV show Bewitched with its Dr. Bombay character propelled her to notice there was a difference between Americans naming American Indians, island Indians and India-Indians. It gradually led her to desire to visit this land that unfortunately is only known for its more horrific stereo Laura Pederson has moved in a new direction with this nonfiction account of her interest in and exploration of modern India. Beginning with an explanation of her fascination with India, she humorously relates how the TV show Bewitched with its Dr. Bombay character propelled her to notice there was a difference between Americans naming American Indians, island Indians and India-Indians. It gradually led her to desire to visit this land that unfortunately is only known for its more horrific stereotypes, some of which do exist but which hardly touch on the many faceted nature of this unique country. So the reader will travel with the author to see just what the truth is. Laura Pedersen doesn't shy away from the good, the bad, and the ugly in her travels. However, it is amazing to see how she touches on all the important aspects of Indian culture. For instance, there are chapters on many cities such as Delhi where the beautiful sites of the Qutub Minar (the world's tallest black minaret) vie with places like the Jain Bird Hospital where birds who are injured from the national pastime of kite flying (bearing little similarity to the American kite flying pleasure) are treated and allowed to heal. Or perhaps you'd like to visit the gorgeous Taj Mahal which in some places occasionally springs a leak (and romantics call shedding a tear). There are glorious spas, shopping enough for any shopaholic, and animal resorts. The diversity of things to do is amazing. And of course there are the culinary delights which range from fiery to mild Indian dishes to salivate the glands of any food lover! Or Mumbai with its Standing Babas who vow to never sit or lay down again to work off any bad karma in their past. Aspects of history are thrown in for good measure, with an assurance that safety measures are as important there as anywhere since the rise of terrorism. Other sections are devoted to little known aspects of the major religions of India as well as a discussion of the benefits and liabilities of the caste system that holds sway in some Indian towns and has been abandoned in more modern cities. There's even a chapter describing the major Indian political leaders and what they are best and little known for during their careers. And there's so much more than what has been described here! I was really excited when I picked up Planes, Trains, and Auto-Rickshaws - A Journey through Modern India and just ended up disappointed! This book claims to “understand India beyond the headlines”. If anything, it perpetuates the stereotypes about India and just adds to the many misconceptions about the country. And it's a bit insulting. For example one of the beautiful aspects of India is the traditional dress called a sari. if you ever visit India or even an Indian boutique here in the US, th I was really excited when I picked up Planes, Trains, and Auto-Rickshaws - A Journey through Modern India and just ended up disappointed! This book claims to “understand India beyond the headlines”. If anything, it perpetuates the stereotypes about India and just adds to the many misconceptions about the country. And it's a bit insulting. For example one of the beautiful aspects of India is the traditional dress called a sari. if you ever visit India or even an Indian boutique here in the US, the people are excited to dress you up in a sari. Pedersen writes about visiting a shop where they custom made one for her and she says "But trust me, you will feel silly. Wrapped like a burrito in a green and gold silk, I looked as if I'd just returned from a spoon-bending party." Hmmm...a bit mean-spirited. I was born in the US and am of Indian descent and have been to India several times. I was interested in reading the perspective of someone's first time to India. I was open to reading excerpts about the extreme poverty, the pollution, lack of sanitation, etc. However, I was also expecting to read about the warmness of the people of India, the heart of the country, the spirituality, the great food, etc. This book is a list of negative viewpoints and a cliff’s notes version of the history. Reading this book would not make me want to go to India. The book is said to provide an intimate glimpse of a nation…there was nothing intimate about this book. Laura Pedersen, the author, fails to capture the true essence of a journey (ups and downs). In speaking with many first time visitors to India, they detail not only the obvious downsides about the country…but also discuss how despite these unfortunate circumstances, people of the slums still have huge smiles on their faces! How people appreciate life and what they do have! How despite living in the slums, children are still finding a way to go to school, succeed and still help provide for their families. How people of all walks of life are welcome to India and treated like royalty! How families are so tight-knit and cherish family time together! How Indian festivals are so lively and involve whole neighborhoods. How people invite entire villages to weddings! How beautiful temples are and how ornate the carvings and deities are, etc! Basically, this book should not be titled a journey…it is far from it! If you’re planning on reading this book prior to a trip to India…don't! I am an Indian. Born and raised in this diverse country, whose norms and ways of thinking might seem strange to an outsider or to someone who wants to know this country better. I guess that tends to happen a lot with writers who want to write about the country – about the so-called enigmatic land of varied cultures and traditions. The experience that start offs as being strange slowly becomes routine and a part of them, hence making the writing easy to believe. There is a context to why I said t I am an Indian. Born and raised in this diverse country, whose norms and ways of thinking might seem strange to an outsider or to someone who wants to know this country better. I guess that tends to happen a lot with writers who want to write about the country – about the so-called enigmatic land of varied cultures and traditions. The experience that start offs as being strange slowly becomes routine and a part of them, hence making the writing easy to believe. There is a context to why I said this. 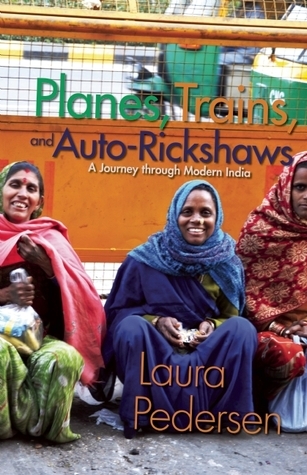 I have just finished reading, “Planes, Trains, and Auto-Rickshaws: A Journey through Modern India” by Laura Pedersen. Therefore, the thoughts that were mentioned earlier. Laura Pedersen has written an account of India, through her travels in the most hilarious manner. She has infused seriousness along the way and humour definitely adds to the atmosphere/settings as described. Laura’s travels are jotted in the most candid form – from the popular stereotypes (the well-known digestive system problems that Indian food can cause) to the clichés that are soon breaking. The book takes readers through almost all of India – covering ground from Delhi to Kolkata to Mumbai to Varanasi as well. The topics touched on are contemplative. Laura speaks of the caste system to the driving styles and the roads in question. All of this is always done with a touch of humour. My first impression on receiving the book was, how would a person who is not from the country write about it? However, that was nothing but the initial apprehension. Laura thought of undertaking a journey through India by watching a TV Show Bewitched, with its Dr. Bombay character that propelled her to see the differences between American Indians and Indians from India. This piqued her curiosity about the lay of the land and hence the journey began with its ups and downs. Laura compares India of the past and India as is now with a keen insight into consumerism and the way it is affecting the entire nation. I found this part in the book to be most apt and one that I could relate to easily. The way she describes the country is but obviously unbiased and objective. There are views that a reader may or may not agree with, however that should not hamper the reading experience. When you are six years old, crossing the street alone is an adventure. When you are sixteen, driving across town can be hair-raising. The first time you leave your home country, going through customs or Passport Control can set your heart racing. Seasoned travelers demand a little more of adventure travel. For Laura Pedersen, who had some preconceived notions about travel to India, India definitely looked like an adventure. "I’d wanted to travel to When you are six years old, crossing the street alone is an adventure. When you are sixteen, driving across town can be hair-raising. The first time you leave your home country, going through customs or Passport Control can set your heart racing. Seasoned travelers demand a little more of adventure travel. For Laura Pedersen, who had some preconceived notions about travel to India, India definitely looked like an adventure. "I’d wanted to travel to India for many years but feared that the poverty and misogyny would be too disquieting. I had read articles about children purposely maimed to beg more efficiently and wives cast out of their husband’s homes after mysterious cooking accidents and forced to live on the streets scarred and deformed..."
Maybe I’m stuck in a glass-is-half-full mode, but that does not strike me as a ringing endorsement for visiting India. Despite the funny one-liners sprinkled through the book, and tons of information presented in an easy-to-digest form, I for one am not persuaded by Pedersen that India is an adventure I’m ready to embark on. Pedersen has digressed from her normal writings and provides the reader with an insight into India. Part travelogue, part history and part philosophy, this book will hit a note with everyone. From Delhi, the Taj Mahal, Mumbai to the south of India all the highlights and then some are covered. Travel tips interspersed with lots of sarcastic humor. Pedersen covers all the major tourist spots but also some of the quaint and extraordinary ones. Pedersen doesn't just cover the good but also touches on Pedersen has digressed from her normal writings and provides the reader with an insight into India. Part travelogue, part history and part philosophy, this book will hit a note with everyone. From Delhi, the Taj Mahal, Mumbai to the south of India all the highlights and then some are covered. Travel tips interspersed with lots of sarcastic humor. Pedersen covers all the major tourist spots but also some of the quaint and extraordinary ones. Pedersen doesn't just cover the good but also touches on the ugly, such as the traffic. Pedersen also covers a lot of the history of India. I found this section particularly interesting. Pedersen discussed how there are many religions and how many of them have taken turns in governing the country. For each of the political leaders Pedersen has written a small biography. Finally a section of the book covered women and children's issues in India. This section of society really has a hard time and even through many things have improved there is still a long way to go before it can be considered to be an equal gender society. Took me about 15 minutes to read this book, and it's amazing that it got published at all. Lots of standard history, some decent de-mystification of Indian culture, and lots and lots of cheesy humor, like the author either wrote it while on the john, at the beach, or while eat on a park bench with a friend. Then again, this makes the reader feel comfortable with her globe-trotting. There have to be better books about India than this one. 1. Comparison of India with US was a bit overdone at places. So awful. I honestly could not understand the thesis of this book or what the author intended. More importantly, I found the author's descriptions of India and its people to be full of weak cliches at best, and ignorant thickly-veiled prejudices at worst. I had higher expectations for this book; but unfortunately, it read like another cliched account of an American traveling in India. Sad! A very light-hearted tour of India with a fair amount of historical and cultural background thrown in. If you are looking for a quick read with humor, this is the book. I personally, learned a lot about India without getting bogged down in a lifeless text. One of my friends recently visited India. She said it was beautiful and very different from the US. This could be a very interesting book. Pedersen's writing, is as always, delightful. But you really have to be interested in India to enjoy the full flavor of the book. A book that can't decide what it is: a travelogue, a guidebook or an opportunity to make social commentary-- so it does a poor job of all. Some funny insights into India. It also included some new information/history that I either forgot or didn't know. Laura Pedersen was born in Buffalo, New York (one of "God's frozen people") in 1965, at the height of The Folk Music Scare. (For details of misspent youth see essay at 'Is there a Nurse in the Church?'). After finishing high school in 1983 she moved to Manhattan and began working on The American Stock Exchange, a time when showing up combined with basic computation skills could be parlayed into a Laura Pedersen was born in Buffalo, New York (one of "God's frozen people") in 1965, at the height of The Folk Music Scare. (For details of misspent youth see essay at 'Is there a Nurse in the Church?'). After finishing high school in 1983 she moved to Manhattan and began working on The American Stock Exchange, a time when showing up combined with basic computation skills could be parlayed into a career. She chronicled these years in her first book, Play Money. Having vowed to become anything but a journalist and with no conception of what a semicolon does, Laura spent the better part of the 1990s writing for The New York Times. In 1994 President Clinton honored her as one of Ten Outstanding Young Americans. She has appeared on TV shows including Oprah, Good Morning America, Primetime Live, and David Letterman. In 2001, her first novel, Going Away Party, won the Three Oaks Prize for Fiction and was published by Storyline Press. Beginner's Luck was published by Ballantine Books in 2003 and subsequently chosen for the Barnes & Noble "Discover Great New Writers" program, Borders "Original Voices," and as a featured alternate for The Literary Guild. Pedersen's other novels include Last Call, Heart's Desire, and The Big Shuffle. Laura lives in New York City, teaches reading and trades Yu-Gi-Oh! cards at the Booker T. Washington Learning Center in East Harlem, and is a member of the national literary association P.E.N. (poets, essayists and novelists).